If you have invested in the stock market, interested in investing in stocks or just interested in the performance of one or multiple companies, you may want to use services on the Internet or software programs to monitor the development. We have reviewed quite a few services in the past that enable you to do that: there is JStock, a cross-platform stock market application programmed in Java, StockTwits, a network for investors and traders, or the Android application Stock Quote. 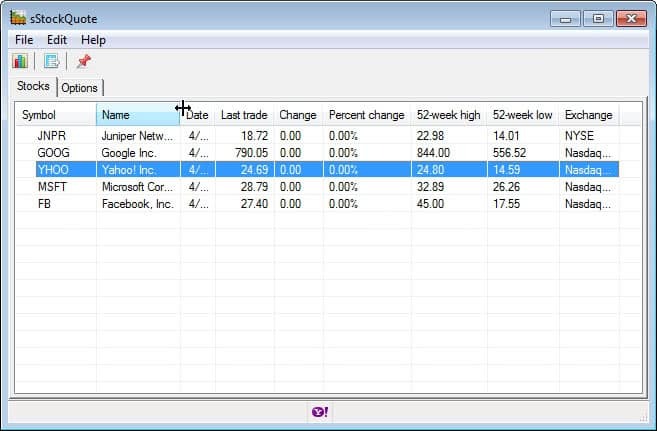 If you are looking for a simple desktop program for Windows to monitor stocks you are interested in, you may want to take a closer look at sStockQuote. Just download the program to your system, unpack it to any location and run it from there. The first thing you may want to do is switch to options to enter symbols of companies that you want to track. You can enter them directly if you know them, or click on the small Yahoo icon in the status bar to go straight to the Yahoo Finance website where you can look the symbols up. You need to click on the refresh button in the main toolbar afterwards so the display is updated with the new information. Each line lists one of the stocks that you have added to the program. Stocks are listed with their name, date they have been added, last trade, change, 52-week highs and lows, and the exchange. The program is by no means a realtime stock market software that updates courses whenever it changes. It is still useful to keep an eye on stocks that you are interested in. The program supports stocks from all over the world. Basically, every stock that is available on Yahoo Finance is also supported here in the program. A click on any of the stocks currently listed in the program takes you directly to the Yahoo Finance page so that you can get additional information about it including latest news, a chart depicting the performance of the day or another time period, and comparison with other stocks. There are a couple of things that I'd like to see implemented. First, an option to update the stock automatically, then options to track your own portfolio using the software. What I mean by that is an option to enter stocks that you have purchased, and when you have purchased them so that you can track their performance and see how that investment turned out. Third, an option to receive stock notifications, and finally an option to display the stock's performance right in the software in chart form. Four stocks introduced in the “options” tab, one from Paris stock exchange and three from Madrid stock exchange, all four obtained from Yahoo page. A clic on the “refresh stock” button gives the info for the Paris stock but no info for the Madrid stocks so it seems to have limitations in the range of stocks supported.